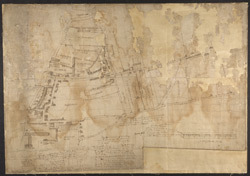 This is a map of the dockyard and town of Deptford in 1623, with additions by John Evelyn, including (near the lower edge of the map) the only known original drawing of Sayes Court house. Writing in 1703, Evelyn notes the great increase in the population of Deptford since the map was made, commenting that, "…the Town is in 80 yeares become neere as big as Bristoll". At this time the 3 largest cities in the country were London, Norwich and Bristol, so this statement demonstrates how rapidly Evelyn perceived the town to have grown in his lifetime.